1. Salad Cutter Bowl: Cutting your lettuce will now be easy, fast, and safe with this salad cutter bowl. Put your salad ingredients in, rinse, and slice…turn and slice again. Perfect salad ready in minutes. 2. Onion Chopper: This is definitely one kitchen item I NEED! I am very sensitive to onions, and cutting them makes me cry every single time. This tool makes it easy to chop your onions, and relieves your tears! Putting this one on my Christmas list this year! 3. Clip-On Silicone Strainer + Funnel Bundle : Have you ever had a hard time draining your pan of hot water while cooking? This clip-on strainer makes it easy to drain your food of water, right into the sink. And it turns into a funner too! 4. Ben & Jerry’s Ice Cream Lock: If B liked ice cream, I would’ve bought this a long time ago. Save you ice cream from intruders and lock it up, so there are no thieves! 5. Melon Slicer: Make cutting you melons super easy, with this slicer. You’ll have perfect slices of watermelon in seconds! 6. Easy Pour Batter and Gravy Grease Separater: I personally want to get this for pancakes or making cupcakes. This easy pour product lets you pour the perfect amount right where you want it. No more messy drips everywhere. 7. Silicone Stretch Lids: These Silicone Stretch Lids come in a pack of 6, and can fit almost anything. Put them right on your fruits and veggies, stretch across any shape or size bowl, and save your cling wrap! 8. Blade Brush Knife and Cutlery Cleaner : Here’s the easiest way to clean your knives and cutlery. Simply slide it through with some soap and scrub away. It even clips on the side of your dish rack. 9. Ice Cream Scoop with Modern Heat-Conducting Aluminum Ergonomic Handle: This isn’t your average ice cream scoop, this one uses your body heat, to help cut through your ice cream easily. No more having to defrost your ice cream. 10. French Fry Potato Cutter: You’ll be making your own perfect french fries in no time with this French Fry Potato Cutter. You can cut your potatoes regular size, or thin cut. 11. Novelty Condiment Shooter Dispenser: It comes with 2 cartridges that can hold 4 oz. Just put one in and shoot your condiments right onto your burger or hot dog. Bring the laughs to your next BBQ. 12. Chemist's Spice Rack, 14 Piece Set: How cute is this Chemist’s Spice Rack Set?! It comes with 14 different pieces, 9 Test Tubes/ 3 Lab Flasks 1 Large Flask for Oil & Metal Rack, and also includes the labels. 13. Pizza Cutter and Server: This pizza server called “Scizza” is a “pizza cutter that perfectly slices any pizza on any surface” and it even serves it too. It won’t scratch your pans either. 14. Cut Resistant Gloves: These gloves will keep your hands safe while cutting meats or foods while cooking. No more accidents in the kitchen, keep your hands protected with these cutting gloves. 15. Avocado Slicer: This Avocado Slicer is an all-in-one tool that splits, pits and slices avocados. 16. Hard-Boiled Egg Cooker and Boiler: This little machine cooks your eggs many different ways. You can cook your eggs hard or soft, scrambled or omelet-style, boiled or poached, and you can even steam veggies too! 17. 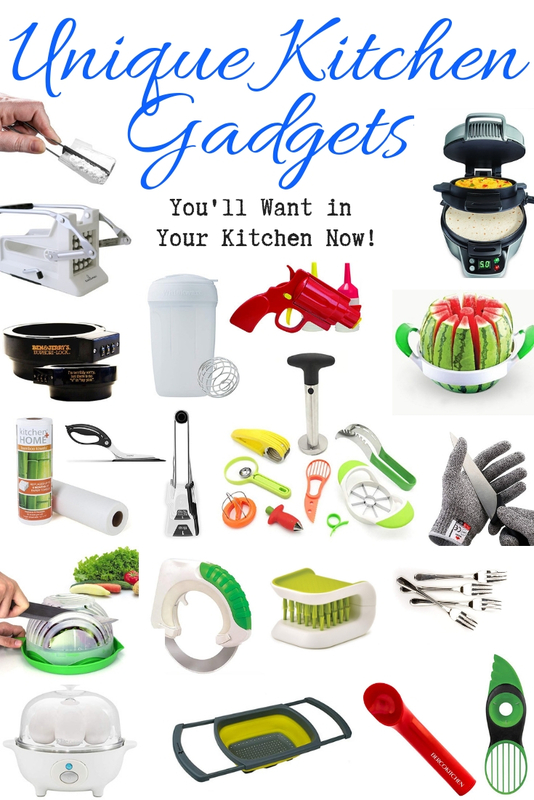 Fruit Tool Kit : This set has all the fruit needs covered…it includes a Fruit Slicer Peeler, Avocado Knife, Watermelon, Banana, and Apple Slicer, Pineapple and Strawberry Corer, Orange and Lemon Peeler, Kiwi, Cantaloupe and Pawpaw Peeler, and a Melon Baller. Set of 9 kitchen tools. 18. Breakfast Burrito Maker : Ready to make your breakfasts a bit easier? Check out this Hamilton Beach Breakfast Burrito Maker! 19. Collapsible Over the Sink Colander : An Over-the-Sink Colander will make cooking a breeze. No more balancing the pot and colander, trying not to burn yourself. 20. Hands-Free Baggy Rack: This baggy stand holds open your bags so you can fill them without dropping everything. 21. Coffee Scoop with Bag Clip: This nifty little clip with seal your coffee bag, but also has a scoop on the end, so you can scoop your coffee, then re-seal the bag again! 22. Stainless Steel Pasta Forks: These forks have rippled prongs that hold spaghetti and other noodles in place without slipping. It comes in a set of 4. Eat Spaghetti like a pro! 23. Strainer & Chopping Board: This chopping board also doubles as a strainer! 24. Avocado Saver : No more brown avocados, this avocado saver reduces the exposure to air to help prevent brown spots. 25. Multipurpose Kitchen Shears : These shears have 5 blades to chop your herbs 5 times faster. 26. Whiskware Egg Mixer with BlenderBall: Scramble your eggs with ease with this Whiskware Egg mixer. It comes with a BlenderBall inside, which helps you scramble up to 8 eggs quickly. 27. Circular Rolling Knife: This Circular Rolling Knife helps relieve pressure on your wrists, since it takes minimal effort to cut. It can cut all types of foods, not just pizza. 28. Lid and Spoon Rest: How many times are you cooking on the stove and you have no where to put your lid, or spoon? This cool product takes away that problem and gives you a perfect spot to hold both without getting in your way. 29. Bamboo Towels: Tired of paying tons of money on paper towels? Try out these Bamboo towels. They are reusable, machine washable, and said that one roll replaces 6 months of towels! 30. Self-Leveling Measuring Spoons: These “Levoon handles squeeze together to scrape off excess ingredients giving a level and accurate measure”. This Set of 4 measuring spoons includes 1 tbsp, 1 tsp, 1/2 tsp, 1/4 tsp.